Landscape with hills and palm trees and the village of Tottiyam. 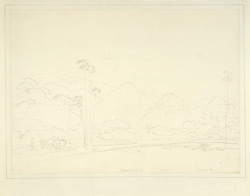 2-3 June 1792.
bl.uk > Online Gallery Home	> Online exhibitions	> Asia, Pacific and Africa Collections	> Landscape with hills and palm trees and the village of Tottiyam. 2-3 June 1792. Thottiyam is in the Tiruchirapalli district of Tamil Nadu on the eastern part of the southern tip of India. Tamil Nadu is a region of cultural diversity containing some magnificent temple towns and interesting historic sites. The landscape of the region is varied; the west coast boasts high rocky hills shrouded in forest while the flat alluvial plains which roll to the Coromandel Coast on the east are characterised by green paddy fields and palm trees.